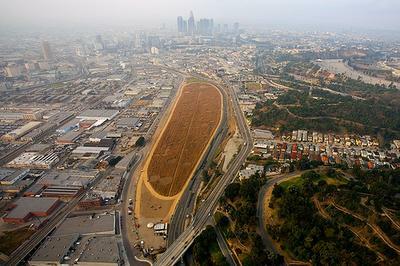 The Los Angeles Times is reporting on an open competition for the cornfield site east of Downtown Los Angeles. Historically a train yard, and most recently an installation by Lauren Bon called Not A Cornfield which, of course, was planted with corn. The open competition will close April 17th, and the 32 acres will become known as Los Angeles Historic Park. The site is in between two busy streets, with the hills of Chinatown on one side, and a warehouse no-mans land on the other. To add to the drama The Metro Goldline runs along side the park joining a twist of bridges and over passes at one end. For a city that has been maligned for it's dependance on automobiles, Freeways and the resulting sprawl. This park more than those modeled after traditional city parks, seems it can become a solution that is solidly about and for Los Angeles. Contributed by our Los Angeles correspondant, Colin Peeples.